New Winter 2018: This gorgeous globe with a spider perched atop it is part disco ball that will reflect holiday lighting in a spectacular way throughout the season. The Christmas spider glass ornament features a golden arachnid and texturing that looks like icicles, a combination that will add interest and brilliance wherever it is displayed. Made from genuine blown glass and quality finishes, these glass globe ornaments are great accents for the tree and look good on an ornament stand on the mantel or shelf. Is there a spider enthusiast on your gift list? 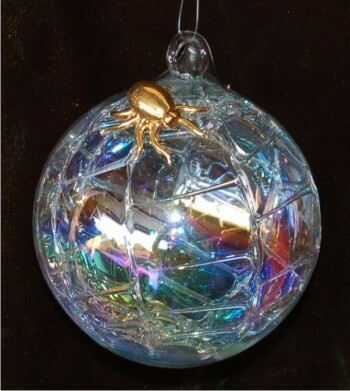 Your gift buying is easy with the glass globe & spider Christmas ornament that will dazzle anywhere you hang it.